Do wasps or hornets re visit an old/dormant nest? Jump Menu: Do wasps or hornets re visit an old/dormant nest? Do you treat bees? How do i identify if it is a wasp or a hornets nest? How often do wasps reproduce? I have a wasp nest under the shed, what should i do? Wasps and hornets build a brand new nest each year. If you have an old nest, it will never be used again and is quite safe to leave it where it is. Unless of course, it is in the way. We do not treat bees. Bees are not considered to be a pest species. If you have honey bees, contact your local beekeeping association. If you have bumble bees, leave them alone, their life cycle is quite short, and they are a very beneficial insect for pollination. If you have either mining bees or mason bees, they are harmless, and you should not be concerned. How do i identify if it is a wasp or a hornets nest? Hornet nests are typically larger than wasp nests and have an open bottom. If you can see underneath the nest, you will be able to see the comb inside. Wasps, on the other hand, have a complete shroud around the nest with an entry hole. Hornets are much bigger and louder than wasps, but they look almost the same. Hornets have a rusty brown colour to them, and they are also nocturnal. If you have insects tapping on the windows at night time, it is most probably hornets. Numbers of hornets in a particular nest will be much lower than that of wasps. How often do wasps reproduce? 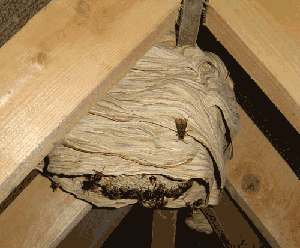 Once a wasp nest becomes established it will have adult wasps emerging from pupation every day. The size of the nest determines the amount that appear each day and how many cells the nest has. Each cell holds a wasp larva throughout its development and pupation stages. Cells are used repeatedly. In the spring when nests are small, the number of cells is limited, this means the number of new adults will be low, but as the nest grows the rate will increase. Call us, we can deal with this type of situation no problem.